AnnMarie Gallivan describes herself as a lifelong student of art and a practitioner of yoga and meditation for the past ten years. 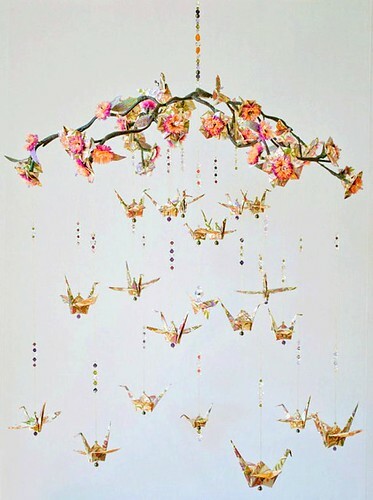 She enjoys creating a variety of ethereal mobiles that feature layered paper blossoms and perfectly suspended origami cranes. I think it's safe to say making mobiles is part of her meditative process. This particular tranquility-inducing beauty is AnnMarie's interpretation of the Japanese cherry blossom tree. It features Swarovski crystals, pearls, and hand painted and gilded leaves, along with folded flowers, cranes, and butterflies. Find AnnMarie via her website, Etsy shop, and Facebook. I'm looking forward to spending time outside again this weekend now that our heat wave has broken, and hope it's nice where you are too. Have a lovely one! We still have a heatwave here. It's pretty permanent really, lol! I'm so glad you are enjoying my blog. One of the great things about sharing awards is that we get to explore so many blogs and make new friends! Love, love, love this! Thank you for posting. Really really beautiful. There is so much here to admire. Thanks for the link to quilled portrait Ann.